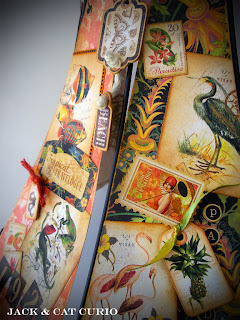 the Graphic 45 & May Arts Blog Hop. So welcome everyone to the blog and more. Here is a recap of what is happening all week long. for a super fun blog hop December 12-16th! bring you the most enchanting crafts! 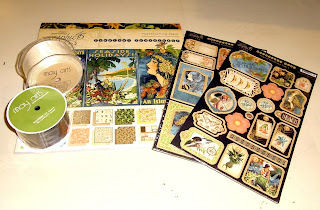 this fantastic blog hop with Graphic 45 and May Arts! Below is the schedule for the week if you want to follow along. Also two prize packs will be given away for this hop. on the G45 Facebook Page to be in the drawing for this weeks prizes. on Monday, December 19th on the G45 blog. So lets start this hop! What did we do for this this hop? pile of junk at this estate sale. Took it home and sanded some old glue off of it. Then we let the creative games begin. We decided to wrap the skeleton with May Arts ribbon. Our first choice of Graphic 45 paper was the Curtain Call collection. Then we switched to Steampunk Debutante. Then we eagerly settled on Tropical Travelogue. All fantastic paper choices for this project. 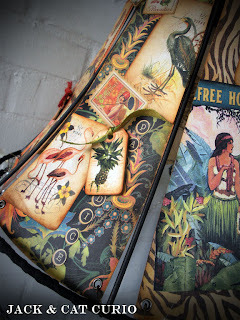 But the new Tropical Travelogue offers alot of color punch. Plus we couldn't get the zebra print out of our minds. Then we created a template for the side panels. This was the only tricky part. It took a few attempts before we got the perfect panel. But once we got it. Started cutting, sanding, inking and layering. Quite happy with the end results. Attached below is also a supply list for those that want to know. Placed on top of another lampshade. Thanks everyone for making the hop. Below is a supply list and a schedule of the other blogs for this weeks hop. Also some fine information about these two fantastic companies. Want to learn more about Graphic 45 and May Arts? Graphic 45 an award-winning scrapbook and paper crafting company­- owned and operated by a mother and her two daughters. Together we create vintage inspired crafting products that capture the flamboyant style of the 1920's and 30's - with vibrant color, irresistible texture and imaginative design to create products with decades-old appeal that's both fresh and familiar. 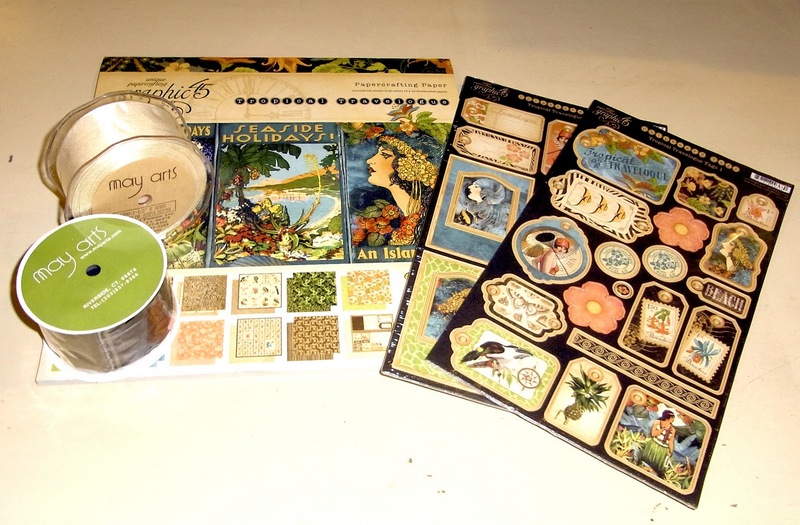 Let our products inspire your next scrapbook layout, card, album, altered art project, or home decor DIY project. May Arts is a ribbon wholesaler, based in Riverside, Connecticut, serving over 16,000 customers worldwide. We offer an exceptional selection of ribbons, including sheer, satin, grosgrain, silk and a variety of patterns and prints. We also maintain a steady stock of inventory so that orders can be fulfilled immediately. As one of the country’s leading wholesalers of decorative ribbons, May Arts has been providing superior products and the highest level of customer service for over 25 years. Hello, Thank you for participating in the Graphic 45 (love them) blog hop. Otherwise I wouldn’t have stumbled onto your blog. What a cool site – love the dark ambiance. I will certainly be back. Now that is a lampshade worthy of getting up on a table and wearing!!! Stunning! 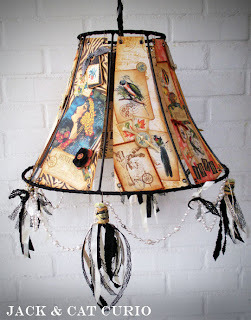 I have a huge collection of old lampshade frames, and this would be a fun way to use them! Thanks for the great tutorial! I'm excited to be a part of the May Arts and Graphic 45 blog hop, and I can't wait to see what everyone makes! OMG! This lamp shade is stunning! Thanks for the tutorial and for the chance to win some fabulous prizes! Absolutely love this. Love the papers and i bet it looks awesome with the light shouting through it!! This is so cool! Love that it's not totally connected, but separate panels. Thanks for a great idea! Wow how cool. Love taking something that's going in the trash and making art what more could you want. Thanks for sharing. Oh you guys never disappoint! How I would have loved to have seen it done in Curtain Call (love that line!!!)! Fabulous, fabulous, fabulous!!!! Wow! This makes me want to find an old lamp shade just so I can create something half as lovely as yours! I just love it! Its so supper cute!! wow this is so amazing..
What an amazing project! The lampshade is stunning! Thank you for sharing! Absolutely stunning - especially when it is all lit up! Clever way to attach the panels to the frame. You guys always think out of the box! This is totally amazing!!! 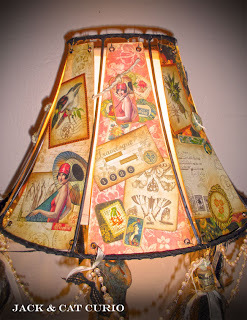 LOVE what you've done with the lamp shade - super creative! wicked cool - just love, love it!! You guys always have the best altered art! Blog Hopping!! Love your blog!! Very unique. Book-marking this one! What a "Totally Wow!" project! I love the lampshade, how you altered it with the Graphic 45 papers and the May Arts ribbon. Thanks so much for showing it illuminated! what a terrific shade! It looks like a piece of art. That is so beautiful! I am "just" a scrapbooker and am so amazed at all the other things people do with exquisite papers. Hi, I am your newest follower and admirer! Wow, this is beautiful... love the vintage, mix of old and new and primitive and elegant! My kind of style! Great job. I would certainly use a vinyl/heat proof laminate (clear) to each panel in case someone will use this as the base lamp shade. Don't want that paper catching fire! 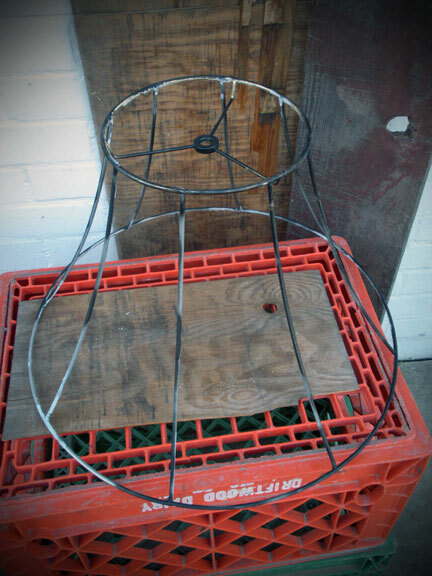 I make lots of shades out of those $1 wire trash baskets from the dollar store. Love this one! 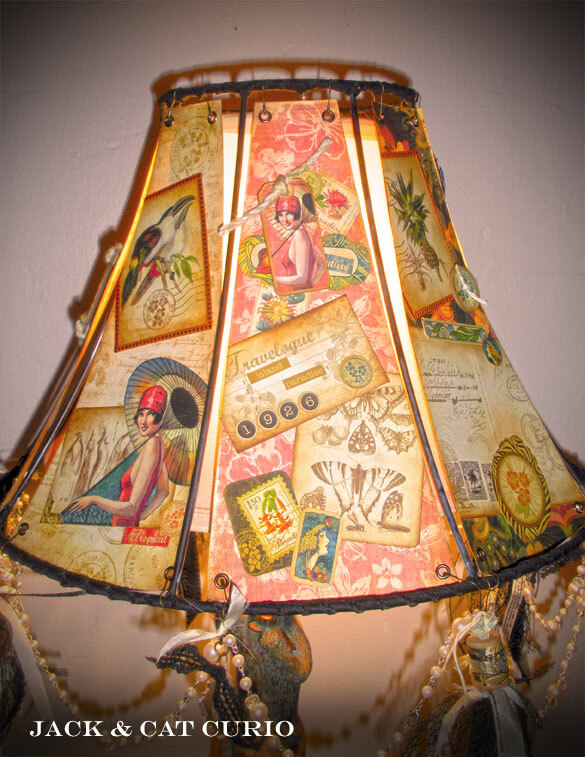 Omg Lamp shade is amazing, love your blog, new to the blogHop scene BUT I thinks it's amazing to see all the blogs and artist ! 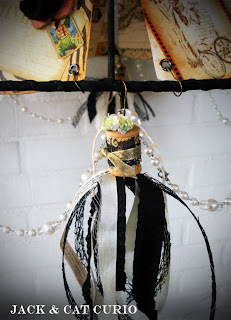 I love the vibe on your blog- so glad that you are participating in the G45 and May Arts blog hop... I'm loving the inspiration I've found here! Great Lampshade. Thanks for the tutorial. Love the lamp shade. I have a few of those that are lying. Maybe I can create some of these!TFS! Why is it I can't get my head out of the idea that my scrap supplies are only for scrap booking and cards? The lampshade is so clever and looks pretty easy too. Thanks for participating in the hop and sharing your inspiration. Wow I just love this! Now that's thinking outside of the box! Lovely! WOW the lampshade is beautiful. I have never seen anything like it, you are very creative. You are amazing.I love the lampshade. Wow, how creative and clever. The lampshade seems the perfect item to display the art of Tropical! The lampshade is pretty. Clever idea. Beautiful.. just loved the lampshade.. Happy hopping.. Terrific shade! Love the color and idea. Love the lamp shade idea. I have an old lamp shade, so I may try this, thanks. Wow! What an incredible project, so unique! How beautiful is that? Thanks so much for the photo with the lamp on because that shoes the shades true beauty. Great one of a kind lamp shade. Love love love it. This is stunning when lit and pretty darn impressive when it's not. Your work is always so inspiring. Keep at it! You have such beautiful ideas. Been following your blog for some time. Love your ideas and your freebies. Happy Holidays! WOW--how absolutely gorgeous! Amazing project. Jack and Cat you are outstanding!! 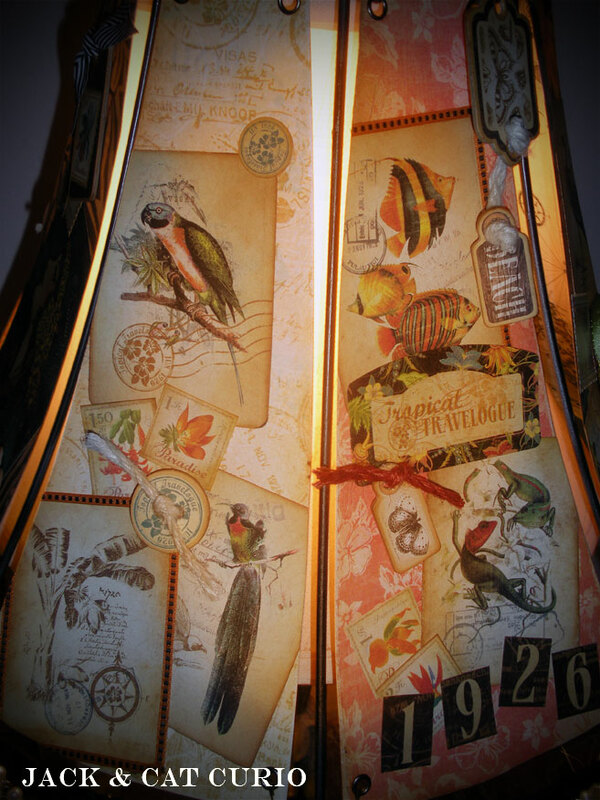 Absolutely love the Lampshade, a gorgeous piece of art!!! Now this is just WAY too much fun! 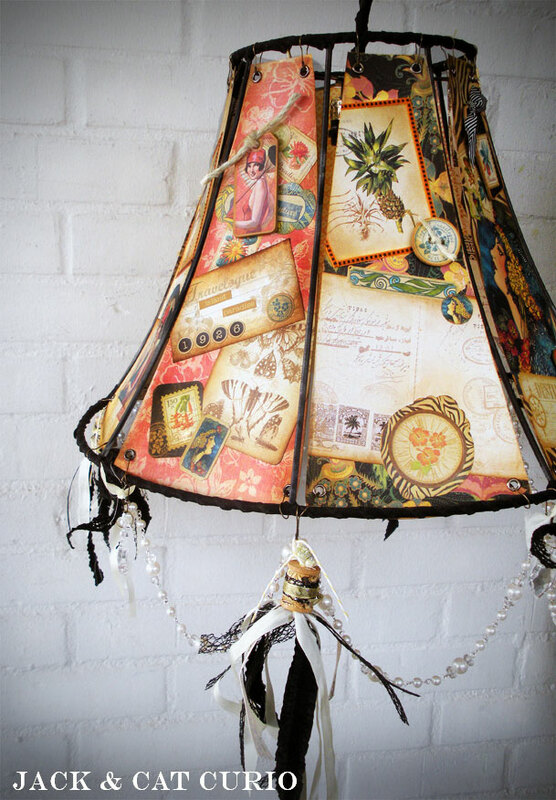 This lampshade is just another one of your incredible projects! Such talent and so different! Thanks for sharing! I just love Thrift shops to get my creative juices going! You really rocked it out with this lampshade!!! How clever! Thanks for sharing! Love this so much! I have got to find me some lamshade with bones like this. Thanks for sharing this week with us. Wow, this is incredible!! I am in awe of anyone who can work in 3-D, and you are obviously awe-inspiring! The Graphic 45 designs go so beautifully with this lampshade! wow! this is so awesome!!! i love this what an out of the box idea and it turned out amazing thanks for sharing!! Wow great project can't wait to try it. Thanks for sharing and for giveaway! Its amazing what you can do with bare bones! Gorgeous! When I saw Jack and Curio on the list, I jumped to your blog first. Can always count on you for out of the box deliciousness. Love the lamp shade! Thanks for the inspiration. Wow what a fantastic idea I just love the lampshade. TFS! Love the lampshade it is such a fantastic idea and so unusual, it certainly wows! what amazing project,who would of thought. Love it. Thanks for sharing. Beautifully unique artwork, as usual! Would love to do this in a smaller version for a chandelier. Great work! Oh I wish I had the type of home where I could make and use something like that. I love this paper!! Very cool lampshade! Oh, I just bought new lampshades...wish I had NOT crushed the frames!!! Cool idea today...thanks for sharing! I LOVE this! It's inspired me to do something similar. COOL site, thanks for sharing! Love the lampshade! What a cute lampshade...love it! What a wonderful job you did on that lampshade from rags to riches. The color choice on those papers is spectacular. Thanks for the inspiration,I'm having a great time blog hopping so many talented ladies and gents. Love your work! So original! Now that's true awesomeness. Love that lampshade!!! Ty for sharing this. Your lampshade is so exotic and vintage looking. I love the way you left the spaces at the sides to show the framework. Awesome design! That lampshade is fantastic!!! I love it!! 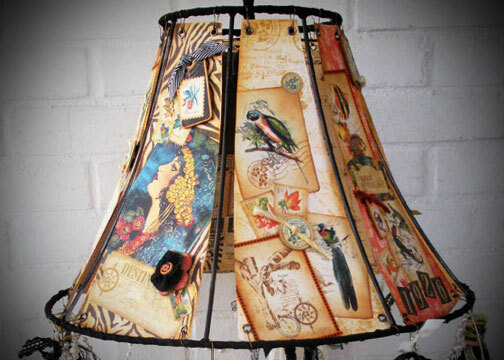 What a great way to spice up an old lamp shade. Maybe I'll buy one in the second hand shop some day and try it out. Love the paper by graphic 45. Makes me want to go back on holiday to Sumatra and Malaysia. what an awesome lampshade! thanks for the sharing. Love this lampshade, very creative and useful. Fantastic and unusual project. And with starting basically with junk you made such a beautiful item! Oh wow what a wonderful lampshade, I have the skelton in the back of the house will have to try this after the hHoliday. What a gorgeous lamp shade! I am loving these projects! Amazing and so unique. Great lampshade. Aww how cool! Its really outstunning for what you guys use the paper!!! Thank you for sharing. The lampshade is gorgeous. I am in love.... with YOUR blog!!! So excited that I found it. I will definitely make this lamp shade. THANK YOU!!! Beautiful lampshade! Very well done! I love repurposed items made beautiful. You have done a stellar job on the project - thanks for sharing the how to's. It is a cross between Dream Catcher and Lamp, nice. You really think outside the box!!! Thank you for sharing your talent with me. BTW... love your blog... It is so cute with the music and all..
Beautiful and so very creative....You are so talented!!!!! A unique addition to any room!! Oh my Gosh!! What a fabulous lampshade...it's da-bomb! A really neat lampshade that would look cool in the library (den) or my craftroom. Thanks for sharing your project. I am going to try this. Merry Christmas. What an awesome redo on that piece of wire! Love it, especially with each side having something just a little different from the others, very awesome :) Thanks for sharing and inspiring! Wonderful ! Incredible ! I loooooove your work ! Monday Kick off! Freebie Collage Sheets! G45 Magic of Oz Trick or Treat Blog Hop! Steampunk Weekend, Collage Freebie, and End of A Great Hop! Summer is here! I love it! April Kits! A Return to Oz!